Watching films of the Far East and listening to their scores can often be a frustrating experience for someone in the West. The magnitude of the musical talent on offer in the likes of Japan, China and South Korea is astounding, yet it is a rare occurrence for their ability to grace the sounds of a Western film and thus depriving a significant portion of worldwide audiences of outstanding musical material. 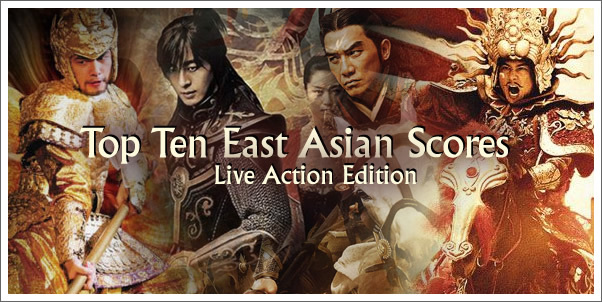 In this Top 10 I have chosen my favourite East Asian scores for live-action film and television after the year 2000. Choosing 10 from over a decade of spectacular film scores was difficult to say the least. Having to leave out the many NHK Taiga drama scores, Tan Dun and Kousuke Yamashita among others was certainly a difficult decision, and the likes of Taro Iwashiro and Naoki Sato could quite easily fill this entire list by themselves. Such is the talent available in the Far East, a number of these score would be in contention for a worldwide top 10, and are therefore most certainly worth your attention. Ryō Yoshimata is TV’s first representative in the top 10 and paves the way with a superbly unpredictable score. Yoshimata’s compositions range from calming string passages, to unrelentingly dramatic action cues. Yoshimata curiously ventures into a Latin soundscape at times, making this score a refreshing change from the stringent routine so many follow today. Listening to Oshima’s score for Year One In The North will likely leave you in a state of confused frustration. The undoubtedly beautiful themes on offer here convey a feeling of restraint and suspicion that Oshima could have produced even greater things. Nonetheless, Year One In The North is an often breathtakingly evocative score and well worth listening to. Perhaps the most unique score within this list; Haru No Yuki is a wonderfully restrained, but unequivocally beautiful experience. Truly appreciating Taro Iwashiro’s score might require more than a single play through, but the time spent is certainly worthwhile as the heartbreaking orchestral music on offer here is unequalled in emotion. The Last Message is often uncharacteristically brooding affair by Naoki Sato that results in some wonderfully timed moments of orchestral catharsis. The Last Message is one of Sato’s more Western sounding scores, with more than a little Remote-Control present, but is still a fantastic musical offering. Peaks and Valleys would be an apt for description for Naoki Sato’s rollercoaster of a score. Moving from gorgeously delicate horn and woodwind melodies, to unyielding percussive action, to soaring orchestral themes, Gaku is a score that grabs the attention and never lets go. Written for Television, Gaku’s score would be equally at home on the big screen such is the depth of the sound on offer here. Perhaps the most internationally known film in this list, Curse of the Golden Flower presents an unmissable opportunity to hear Shigeru Umebayashi at his very best. His combination of traditional orchestral might and ethnic instruments is at times achingly beautiful, particularly in the outstanding two closing tracks of the soundtrack. Not to be missed if you yearn for a more traditionally Eastern sounding score. The third TV series in the list, and the sole appearance of South Korea. Regardless of the country of origin, Hisaishi’s score is one that will hook listeners instantly with the beautiful opening rendition of the show’s main theme. Primarily known for his music heard in the films of Hayao Miyazaki and Studio Ghibli, Hisaishi shows he can shift between animation and live-action seamlessly. No doubt, this is among the very best of Hisaishi’s career. A Japanese composer for a Chinese historical epic and the most expensive Asian financed film to date. The formula certainly works, as Taro Iwashiro’s score is instantly gratifying with a tremendously catchy main theme that is reshaped beautifully throughout the score. Both Chinese soundtracks (Parts 1& 2), and the US soundtrack are rounded out by stunning vocal performances by Chinese vocalist Alan. Relentless. One word to describe Naoki Sato’s assault on the emotions during Space Battleship Yamato. The Japanese special effects extravaganza may have been a feast for the eyes, but the score does wonders for the ears. Naoki Sato’s outstanding talent for fleshing out onscreen emotion and excitement is in full-effect here and results in a consistently thrilling listen. His third appearance in this list, confirming that I am indeed a Naoki Sato obsessed. The Promise is quite easily the highest point in Klaus Badelt’s career so far, and would compete for that honour in the back catalogue of numerous composers today had they composed it. The use of a German and Hollywood famed composer for a Chinese film may have seemed a curious decision, but has yielded unforgettable results. From the heart-wrenching love theme to the breathtakingly beautiful opening vocal piece, The Promise is a stunning score of the absolute highest calibre, and is among the best scores in recent years of not just Chinese and East Asian cinema but worldwide. So what do you think? Tell us some of your favorites scores from this largely unexplored sub-genre of music!